White Tank Mountains, Water, Golf views in Gated PebbleCreek Golf Resort. Enviable lifestyle. Executive landscaping maintains a high level of privacy. Entertain in your home with too many features/upgrades to list. Owners spent additional $350K+. When you enter, you will find a perfect blend of warmth and sophistication. Modified floor plan, 12'x5' pantry, dream custom walk in closets. Chef's kitchen, custom marble/granite FPs, elegant fixtures. Casita adds 287sf.for a total of 3392sf. Silver travertine on all hardscapes and driveway. Decorative security doors, covered and open courtyards. 50 owned solar panels. 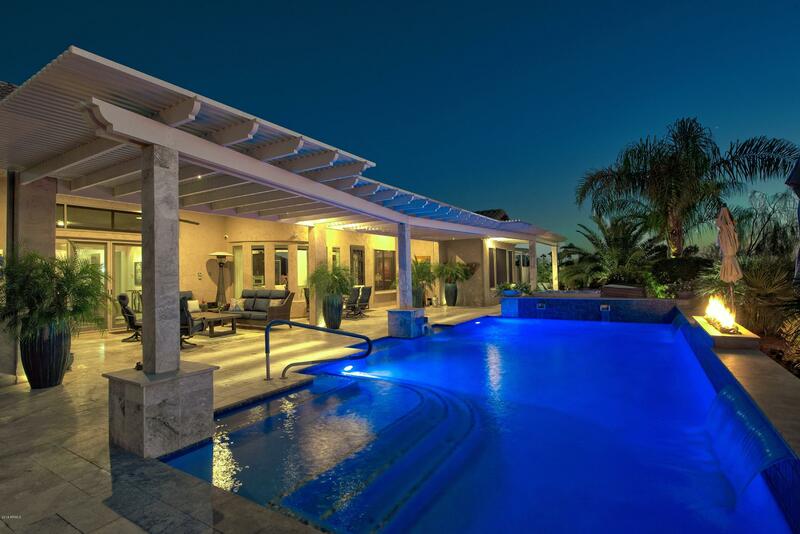 Luxurious 20'x40' salt water pool w/mood lighting, fire feature and waterfalls. Built in hot tub. Travertine shower and gas fire pit. BEYOND EXPECATION!! In Addition to all this and more, you will love the lifestyle and amenities of PebbleCreek.